I must admit, I have been very reluctant in using vagrant for while before I have seen the light. I actually had my wow moment when I managed to set up a complex virtual IT infrastructure to simulate a deployment architecture with just few lines. Let’s get going with our task today. For those still unsure of what vagrant is , please here to their why-vagrant page . This tutorial greatly assumes that you have Virtualbox installed and that you are familiar with it’s usage. If not you can head to their online manual or better still this simplistic tutorial to have a fair idea on what it does or can do. One cool thing about vagrant is that there are providers of those images like atlas hashicorp or vagrantbox.es . I actually prefer the former. ==> box: Successfully added box 'ubuntu/precise64' (v20150619.0.0) for 'virtualbox'! Of course I have added a couple of other base boxes to my vagrant so my list will be slightly different from yours. Let’s say we want to start an apache2 web server project with 64bits Ubuntu precise (12.04). We might want to create a file called vagrant_ubuntu_apache and create our vagrant file inside. On my computer I will use home folder and create the vagrant folder in it. 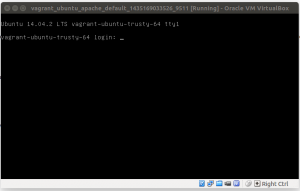 We would like to use the 64 bits version of ubuntu server to do the installation so we will instruct vagrant through our Vagrantfile of such intentions. Make sure your Vagrantfile looks like the one below. ==&gt; default: <code>vagrant box update</code> to update. What does that tell us? This means there have been some port forwarding stuff and that on the port 2222 of our own host we can access our guest on its port 22 over ssh. Explanation of port forwarding is something very difficult as I just know what it does rather than what it is. Wikipedia will surely help you gain more understanding than me. The info above also tells us that vagrant uses a private key to connect. So there are 2 ways of connecting to our vagrant box. The first is the in-built method from vagrant with the command vagrant ssh shown below. New release '14.04.2 LTS' available. ECDSA key fingerprint is 02:2e:eb:24:28:50:7b:e0:44:57:77:fd:51:8d:6a:d1. Jay!!! We connected to our box using both ways. This looks like just a onliner change : “config.vm.network “private_network”, ip:”192.168.56.190″, :adapter =>2″ . Assuming we have already setup our HostOnly network like said in the referenced tutorial we are basically telling vagrant to use the private_network, assign the IP : 192.168.56.190 to the box on the adapter 2. That’s it. What a shocker ;( , I have been spending time doing this manually all this while . Let’s start our box again and see whether we could connect again using 2 ways and on the static IP this time on the HostOnly network. PING 192.168.56.190 (192.168.56.190) 56(84) bytes of data. It looks like our box if up on the IP 192.168.56.190 let’s connect with vagrant command and via simple ssh interface. The authenticity of host '192.168.56.190 (192.168.56.190)' can't be established. ECDSA key fingerprint is 36:52:9c:b3:ae:7f:55:b9:ae:4a:aa:7e:75:cd:47:26. Warning: Permanently added '192.168.56.190' (ECDSA) to the list of known hosts. The ssh method also worked just that this time we use the assigned IP on the regular port 22 which is omitted. i is a variable on the the loop iterates. I hope this helps . Voila!! Enjoy and no more monkeyfication with manual Virtualbox installation.